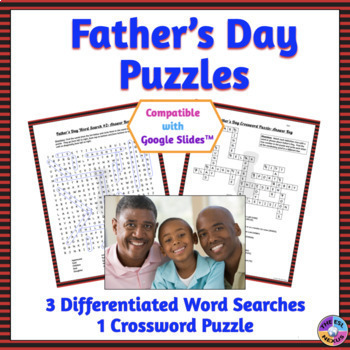 Give your students a head start on honoring their fathers (or father-figures) with the 3 word search puzzles and 1 crossword puzzle in this Father’s Day resource. All the puzzles use 20 words related to this paternal holiday. Please see below for a list of the terms. ★ 10 of the words used in these puzzles are also used in the complementary Mother’s Day resource, available HERE. Use them both to reinforce your students’ learning! 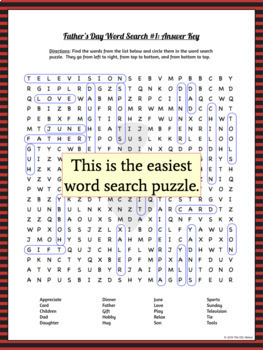 The word searches are available at 3 levels of difficulty, based on the direction the words are written in the puzzle, so they can meet the needs of all your students, including English Language Learners. Answer keys are provided for all the puzzles. 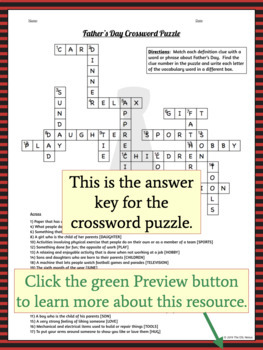 In addition, there is a word bank for the crossword puzzle for students who need additional support. ★ For words that may be new, you can have your students find their definitions and use those words in sentences. ★ Students can also draw pictures that illustrate the words to show their understanding. ★ More proficient students can write paragraphs or stories that include some of the words. ★ Extend your students’ learning by having them record their sentences or stories online, for speaking and technology practice. ★ Have students create a Father’s Day card that includes a picture of one of the target words. ★ Ask students to use some of the target words and explain how they celebrate Father’s Day in their family and/or country (if they are immigrants and willing to share their customs). Both Print and Google Drive™ versions are provided for all the puzzles. 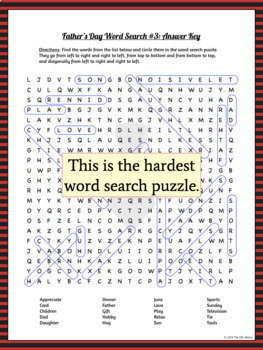 The PDF file includes teacher notes, instructions for accessing the online materials, instructions for completing the puzzles as well as all the word searches and the crossword puzzle with their answer keys. The Google Drive™ materials include directions for using the materials, the word search puzzles and the crossword puzzle, and the answer keys for the puzzles. The terms used in the puzzles are: Appreciate, Card, Children, Dad, Daughter, Dinner, Father, Gift, Gratitude, Hobby, Hug, June, Love, Play, Relax, Son, Sports, Sunday, Television, Tie, Tools. Your students will enjoy celebrating Father’s Day with this resource! If you would like to receive updates about my new products, please click HERE or on the green star under my store name at the top of your screen. You can earn TpT credits that reduce the cost of your future purchases by giving feedback about this product. Just click on the "Comments & Ratings" tab after downloading to leave a comment and a rating. It's that easy! © 2015 Google Inc. All rights reserved. Google Drive is a trademark of Google Inc. The ESL Nexus is the sole creator of this product and does not claim endorsement or association with Google, Inc.
Common Core Standards © Copyright 2010. National Governors Association Center for Best Practices and Council of Chief State School Officers. All rights reserved. Any claims of correlation or alignment to the CCSS Standards are solely those of The ESL Nexus and have not been evaluated or endorsed by the NGA. The ESL Nexus is the sole creator of this product and does not claim endorsement or association with the creators of the CCSS standards.